The Sea Captain’s Wife brings readers into the extraordinary world of Eunice Connolly. Born white and poor in New England, Eunice followed her first husband to the Deep South and soon found her relatives fighting on opposite sides of the Civil War. Back in New England, Eunice and her children struggled to get by—until Eunice fell in love with a well-to-do black sea captain, married him, and moved to his home in the British Caribbean. Tracking every lead in a collection of 500 family letters, Hodes retraced Eunice’s footsteps and met descendants along the way. The Sea Captain’s Wife takes up grand themes of American history—war, racism, freedom—and along the way illuminates the lives of ordinary people in the past. 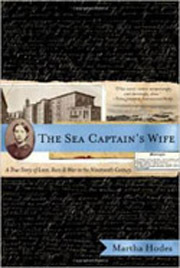 For more information on The Sea Captain’s Wife, click here.